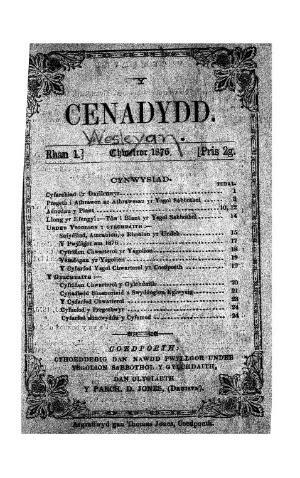 The quarterly periodical of the Coedpoeth Wesleyan Methodist Circuit. The periodical's main contents were religious articles alongside news and reports related to the circuit's Sunday schools and to the circuit generally. The periodical was edited by David Jones (Druisyn, 1840-1902). Associated titles: Cylchgrawn Chwarterol y Trefnyddion Wesleyaidd, Cylchdaith Coedpoeth (1888-1967).